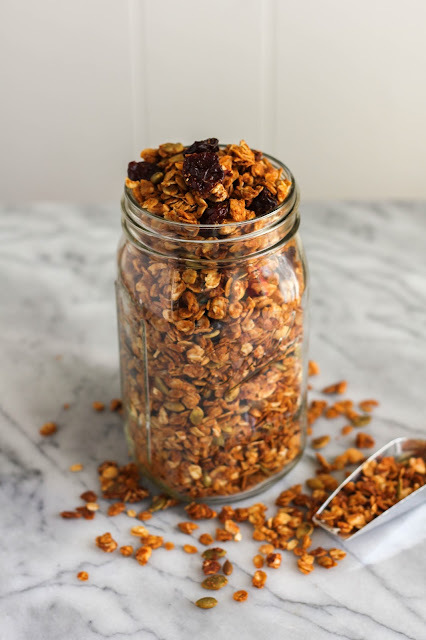 Peanut Butter Harvest Granola and enjoy it with your family for breakfast or as a snack! I don't know about you, but I looove peanut butter. On toast, in a sandwich, in my baked goods, even in my smoothie. It's delicious no matter how you eat it and it's really quite a versatile ingredient. Peanut Butter & Co. and Bob's Red Mill declared October as #Oatober. As part of the #YumSquad, I was tasked with developing a recipe using peanut butter and oats, and of course I was thrilled! I mean, what's not to love about peanut butter and oats? One of my favorite breakfasts, especially during the week, is yogurt topped with granola. It's quick and easy, and can also be portable if need be. 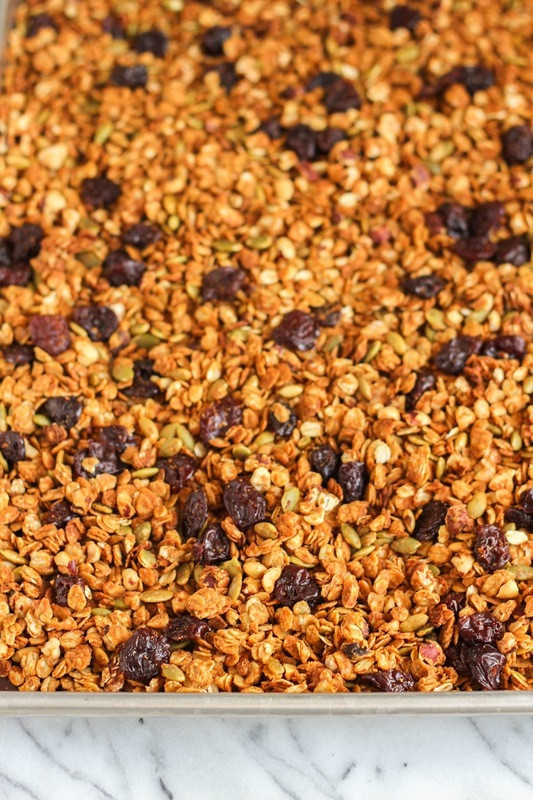 I decided to take one of my favorite flavors of Peanut Butter & Co. peanut butter, The Bee's Knees, and mix it with some Fall ingredients to make a delicious and healthy granola. I call it Peanut Butter Harvest Granola! The pumpkin seeds, hazelnuts and dried cherries seems like a perfect Fall combination! 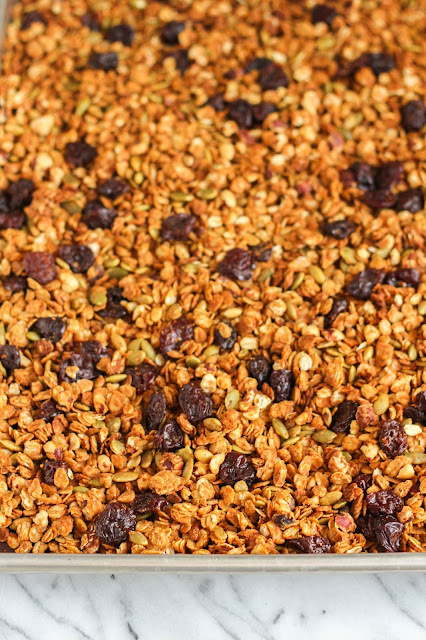 If you haven't made granola at home before, I promise it's easy! Warming the peanut butter and honey before mixing it with the dry ingredients makes it smooth and easy to pour. A quick bake in the oven and you're on your way to a delicious breakfast or snack for the week ahead that the whole family will love! Now let's make some granola! Preheat the oven to 350 degrees. Line a large rimmed baking sheet with parchment paper or a silicone liner and set aside. In a large bowl, combine the oats, hazelnuts and pumpkin seeds and stir to combine. In a small saucepan, add the honey, peanut butter, cinnamon and salt. Cook over low heat until the mixture has melted and is smooth. Immediately pour the mixture over the dry ingredients in the bowl, using a rubber spatula to mix well, making sure to coat everything. Spread the mixture evenly on the prepared baking sheet and bake for 30 minutes, stirring occasionally. The mixture should brown evenly. The longer you leave it in the oven the crunchier the granola will be, but be very careful not to burn it as towards the end of the cooking time it browns quickly. Remove the pan from the oven and immediately add the dried cherries. 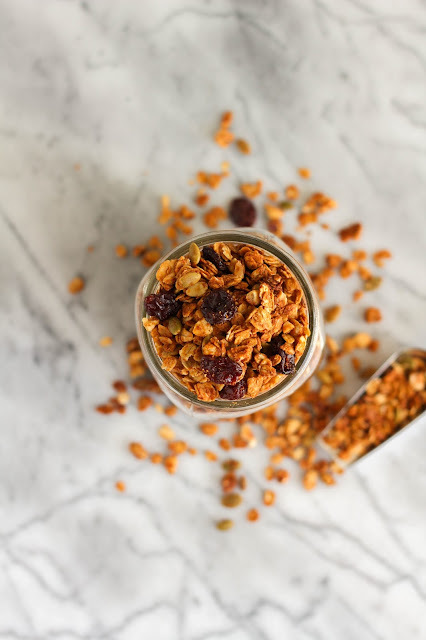 Set the pan on a wire rack to cool, stirring once or twice, until the granola reaches room temperature. Transfer to an airtight container to keep the granola fresh. Serve over yogurt, as a cereal, or just as a snack! Disclaimer: As a member of the Peanut Butter & Co. Yum Squad, I received products at no charge, however, all opinions are my own.